The first presidential debate helped uncommitted voters learn about the candidates - and it appears that Democrat Barack Obama benefited the most, according to a CBS News/Knowledge Networks poll taken immediately following the debate. Uncommitted voters said Obama won the debate against Republican John McCain, and more of those voters improved their opinion of the Democrat. But while 66 percent think Obama would make the right decisions about the economy, 56 percent think McCain would do so about Iraq. Immediately after the debate, CBS News interviewed a nationally representative sample of nearly 500 debate watchers assembled by Knowledge Networks who were "uncommitted voters" - voters who are either undecided about who to vote for or who say they could still change their minds. Thirty-nine percent of these uncommitted debate watchers said Obama won the debate. Twenty-four percent said McCain won, and another 37 percent thought it was a tie. Why did voters' image of Obama improve? Many volunteered that they were impressed by his poise and knowledge about the issues, that he was more knowledgeable about the issues than they thought previously. When it came to McCain, those same voters said he "didn't control himself well under pressure," that he was "angry and bad-tempered," and that he "talked too much about the past." On the other hand, voters who thought McCain won the debate felt he showed more experience and understanding of the issues - particularly foreign policy. Many felt he exceeded their expectations in how he presented himself tonight, saying he was a "better debater" and a "skilled speaker." Although much of this debate addressed foreign policy issues, the candidates talked about the economy for about 30 minutes - which is after all what voters say is their most important concern. Uncommitted debate watchers saw Obama as the clear winner on handling the economy; 66 percent felt he would make the right decisions about the economy, while 42 percent felt McCain would do so. But when it came to the war in Iraq, McCain was the stronger candidate. Before the debate, 44 percent said that McCain would make the right decisions about the war; that rose to 56 percent after the debate. Fewer thought Obama would make the right decisions on Iraq. Both candidates made some gains in presenting their respective visions for the country. Sixty-five percent said that Obama made it clear what he would do as president; 64 percent said that of his rival, McCain. In national polls of registered voters overall, one of McCain's strengths has been the perception that he is ready for the presidency, while Obama's has been the perception that he is empathetic to voters' needs. Uncommitted voters who watched the debate share those perceptions. But while eight in 10 uncommitted voters who watched the debate think McCain is prepared to be president, six in 10 now think Obama is prepared as well - a significant improvement from his standing among these same voters before the debate. The percentage of watchers who think Obama understands their needs and problems has also increased by 21 points, while a majority still say McCain does not. Uncommitted voters include those who say they have a preference, but also say they could still change their minds. 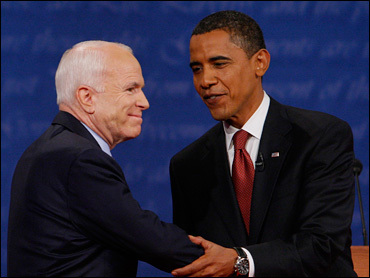 Before the debate, 36 percent favored Obama and 34 percent favored McCain. Obama now leads by 12 points among uncommitted debate watchers - 41 percent to 29 percent -- in their choice for president in November. But nearly three in 10 remain undecided, and most of those with a choice now say their minds could still change. This CBS News poll was conducted online by Knowledge Networks among a nationwide random sample of 483 uncommitted voters - voters who don't yet know who they will vote for, or who have chosen a candidate but may still change their minds - who have agreed to watch the debate. Knowledge Networks, a Silicon Valley company, conducted the poll among a sample of adult members of its household panel, a nationally representative sample given access to the Internet via Web TV. The questions were administered using the Internet. This is a scientifically representative poll of undecided voters' reaction to the presidential debate. The margin of sampling error could be plus or minus 4 percentage points for results based on the entire sample.